A rematch of the past season’s MSL finals returns to the semifinals of this OSL. Stork will have his chance for revenge while Bisu will attempt to best Stork for a second time. Whomever advances will be given an excellent chance at their first OSL title. Bisu with his amazing PvZ play would be the clear favorite against Jeadong, while Stork has already shown that he can handle the Zerg player. He has done so already during group stages. The night’s match is a best of five, the winner moves on to the final match of this starleague. But the loser isn’t out of it yet. He will have a chance to secure a seed for next season against UpMagic, or fall down to the OSC playoffs to once again fight for an exclusive spot in the OSL. The series begins on Persona, the first PvP match to be played on this new map. Bisu begins as green at eleven and Stork as purple down at five. Both players set down their gateways to be warped in at home before sending out a probe to scout for the enemy. Each player sends his probe to the eight position, arriving there at nearly the same time. Stork, seeing Bisu’s probe going in to scout there concludes that Bisu must not be there and does not even bother to check, continuing right along to the eleven spot. Bisu does not make the same observation and continues checking eight before moving down toward Stork at five. Both players opt to go with two gate openings, their second gates warping in simultaneously with the opponent’s. Both take their gas and get a nexus at the natural expansions. Twin cybernetics cores go up as the two players refuse to deviate build orders from one another. Both warp in robotics facilities at their naturals and Bisu makes the first build differentiation by getting an assimilator at his expansion well before Stork. A second Robotics facility begins for Bisu followed by an observatory and third gateway as he continues building in a different direction than Stork. Stork has chosen to start gateways both three and four while also getting a citadel along with his own observatory. After the little bit of deviation from one another, they both make their robotics support bays and forges. After a quick scout with an observer, Bisu sends out his forces, finally looking for some action. A group of zealots, a couple dragoons and a reaver-shuttle combo head southward, but think twice as Stork sends out his own army with superior zealot numbers. The extra gateway pulls its weight. The Revolutionist’s forces will have to stave off the attack at the dark swarm leading into the base. The armies engage there as Stork’s zealots rush into the dark swarm. 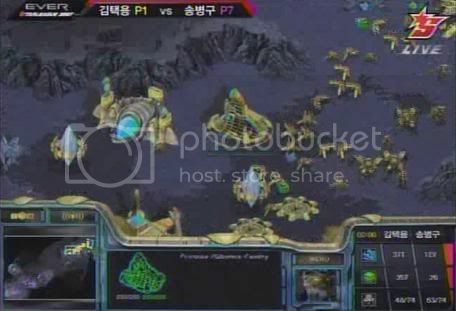 Meanwhile, away from the action, Bisu sends his reaver-shuttle toward Stork’s base while Stork sends his first observer on a recon mission to the other side of Bisu’s encampment. Bisu’s shuttle returns home to support there. The extra reaver support allows Bisu to hold off the enemy, but the reavers are nearly all that either player has left after the skirmish. Stork’s reconnaissance mission proved to be worthwhile as the observer detects an unprotected back end from Bisu. He takes his own reaver-shuttle around to that end of the base and assaults the mineral line, taking out the majority of the probes there before Bisu notices, while four zealots move north and hide near Bisu’s base, waiting. After the damage is done, Bisu once again moves out, with two shuttles full of reavers. The observer from Stork sees the mobilization and he is given time to prepare for the invasion. As Bisu’s forces arrive halfway across the map, Stork four zealots-in-hiding reveal themselves in an assault on the expansion along with another reaver drop at the main. Another attack comes from stork as he moves his own forces to engage with Bisu’s main strike in the center of the battlefield. The zealots on delta force take out the defenses at home along with the reaver while alpha squadron has more dragoons than Bisu can handle as Bisu’s last shuttle retreats along with its reaver buddy. Bisu finally deals with the zealot sneak attack, but that only buys enough time for stork to have moved all of his army to Bisu’s front door. Stork uses a quick action to remove the only enemy observer he sees as his dark templar trudges across the map. It arrives with no opposed detection as it initiates the strike, taking out Bisu’s only reaver. The mass of dragoons follows the templar in as the enemy retreats from under the dark swarm, allowing Stork to occupy the ramp. A reaver drop for Bisu at Stork’s expansion cannot save him from the annihilation at his own base and Stork takes the first game. The second game sees Bisu as brown at the GenoSky location and Stork is purple again, starting at Nostalgia. Both players start with gateways, with Bisu’s being followed by scouting. Stork sends his scout a bit later, but proves to have a bit more luck as he scouts Bisu’s location right away, while Bisu does so on his second attempt, after checking Gaema Gowon. Stork gets an early cybernetics core while Bisu starts his a bit later. A second gateway warps in for Bisu while Stork elects to warp in a robotics facility before his second gateway due to the favorable map position for dropping. 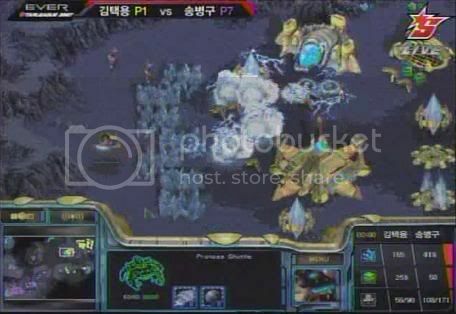 Bisu begins his own facility just as Stork’s finishes warping in and his reaver tech commences. Bisu is the first to act, sending a trio of zealots and pair of goons to attack. They meet four of Stork’s dragoons, soon to be accompanied by a fifth, what survives retreats after seeing Stork’s support bay. Bisu gets an observatory and begins his own support bay. He also takes the opportunity attempt expanding to his natural. Stork moves his dragoon army out with a reaver flying above. The following drop at his main does little damage before fleeing as Bisu is prepared for it. The reaver rejoins the dragoons. Stork assaults the warping nexus, forcing Bisu to cancel. Stork then takes his own opportunity to expand to his natural. His forces remain at Bisu’s failed explansion attempt, containing the enemy as Stork guards the ramp from below. 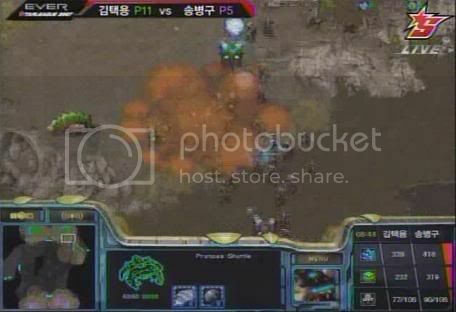 Bisu lets a probe loose by use of his shuttle to the southeast of his main. It makes a pylon to the south of Stork’s base. Bisu’s begins to shuttle zealots and dragoons out of his main in the same manner, amassing an army on the outside of his base. Stork sees Bisu’s hidden pylon with a dragoon and removes it. An observer of his also sees Bisu attempt at relocating his army. Stork’s forces at Bisu’s natural and the forces at his main move to flank Bisu’s hidden army. Stork decimates Bisu’s forces there while removing the offending shuttle. They pursue the last fleeing units as Bisu once again attempt to expand. Bisu’s remaining forces move out, a troop of dragoons and a pair of reavers in another shuttle. Stork’s dragoons rest on the center plateau as they are attacked. With superior targeting, Stork is able to crush the assault with no reaver support, destroying the shuttle as it picks up the final reaver. Bisu is left with nothing as Stork’s forces still remain strong and Bisu will have to fight back from being down two games to none. 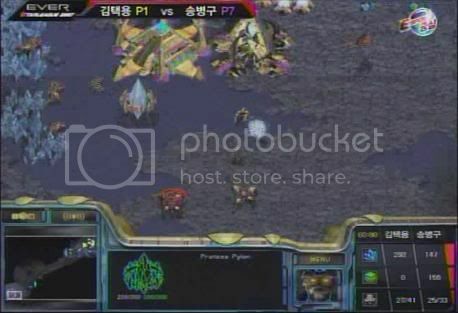 Bisu spawns as the yellow player in the upper right, while Stork will try to channel the power of purple Protoss for a third straight victory and the advancement to the finals. Bisu will try a double gateway once again, despite it not having worked out so well for him yet; and Stork pairs his first gateway with an assimilator. Bisu is the first to send out a scout, Stork follows suit as a probe arrives at his base. A cybernetics core finishes warping in for Stork as Bisu begins trickling his zealots downward. A dragoon is out in time for Stork and as a second comes in he is able to hold off the attack. 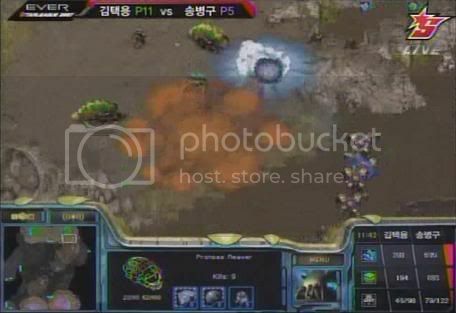 Bisu would likely have taken this chance to expand, but Stork plans ahead and makes a pylon at Bisu’s natural to keep the nexus from going in. Bisu fixes the problem quickly. A citadel comes in next for Stork, behind his mineral line. Bisu has made a forge and begins protecting his natural with two cannons to force Stork’s dragoons hold outside. A templar archives, robotics facility and expansion come in next for Stork as Bisu continues to keep the match commentators from scouting him at all. The match observer finally penetrates Bisu’s defenses to see a templar archives warping in for him as well followed by a robotics facility. Stork, already having his facility for robotics makes an observatory. 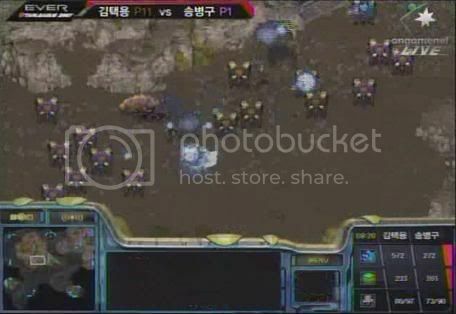 Stork’s first two dark templar are out and they catch a shuttle ride toward Bisu’s mineral deposits. With no cannons at either mineral line, the dark templar take out many probes and halt mining all together. Bisu’s first two dark templar are also on their way for assault, but by ground instead of air. They are revealed by Stork’s observer and are unable to do any damage. Over a minute passes before Bisu is able to resume mining operations. In that time Stork has been able to put up a total of six gateways and begins to pump out high templar. Stork begins moving out with a group of dragoons coupled with a few zealots and a high templar. Stork makes another expansion and adds to his forces and begins the trek toward Bisu. Bisu storm drops Stork’s natural and gets a few probes. Stork presses at Bisu’s expansion, which is defended with three cannons and Bisu’s army. The cannons and a couple of better placed storms help Bisu fend of the intrusion long enough to produce the few extra dragoons to push Stork out. Bisu catches up to Stork in gateway count, but is still behind by an expansion and overall development, he gets to work on his next expansion right away. Stork sends a storm drop to Bisu’s natural and the pair of templar there were even more successful than his reaver from the first game. Stork begins sending more units to the center of the map before moving forward again. The two armies clash on top of the plateau on Bisu’s side of the map. They cover the entire screen in psi storms. Bisu’s comes out ahead, but it is a pyrrhic victory. He shortly realizes that his quest to catch up and win is in futility and Stork takes game three and advances to fight Jaedong for the OSL title. Good read, dear sir. Even though I watched the games live and then the vods. Great read and not overly long, Bisu was simply completely outclassed in every aspect of the game. 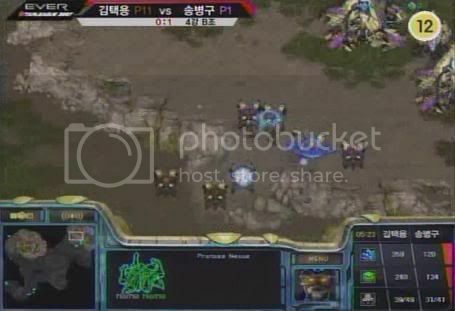 It seems that both Bisu and Savior have become one MU wonders now after their shining moments, ironically in ZvP and PvZ. Awesome write up, nice captions! have u watched any of the savior's recent zvt? He either lings the opponent to death, or loses in either mid or late game to any half-decent opponent. His defiler use isn't as scary anymore, his all in's fail, and his timing isn't very patient. bisu got wtf raped, this was a sad sad semi. Snowflakes in January, Heart warm like February, I wouldn't ordinarily..
lol! Who are those "half-decent" opponets? Flash, who, in his short pro-history, is 1:0 against Jaedong and almost took bo5 from GGPlay when GGPlay had momentum? FBH? Or maybe hwasin/iris? There is no sign that allow you to so blatantly disparage his skills and call him one mu wonder. Thank you, semioldguy! Reading now. Anyway. This was well constructed, and enjoyable. Healthcare jokes could never be truer, Bisu seemed ill himself after that series. Now, looks like this OSL is Stork's to seize. One match wonders? 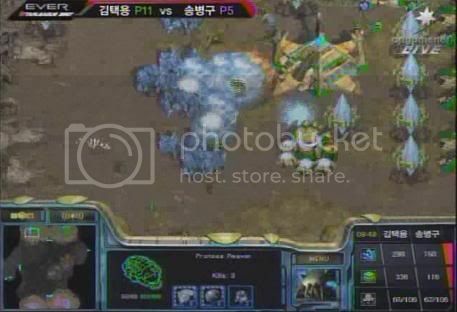 Bisu's PvT is better than anyone asides from Stork, his PvP is on par if he had not been so terribly outplayed in terms of build orders (surviving a double gate like that is almost auto-win) and his PvZ is unbeatable. Bisu is still a force to be reckoned with, he's arguably the most well rounded and valuable Protoss out there. He may not be completely un-beatable, but even if he's having a bad run then he's very, very dangerous.